Introducing the sleek two-tone Constellation Manhattan ladies' timepiece by Omega, with a 29mm case and bracelet crafted from 18ct Sedna™ gold and stainless steel. A pure white mother-of-pearl dial is set to dazzle with diamond hour markers and date display window at the 6-o-clock position. 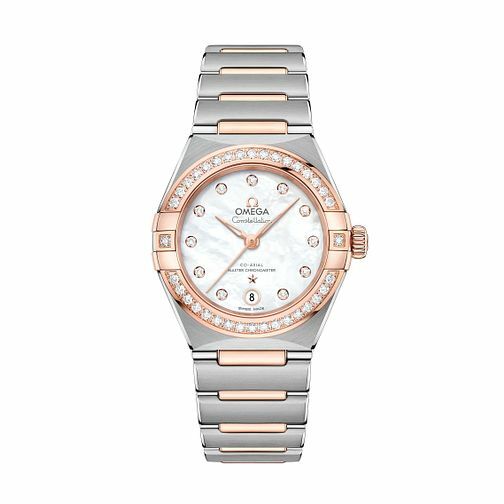 The diamond embellished bezel, hands, Omega logo and Constellation star also grace this watch in 18ct Sedna™ gold. The caseback features domed scratch-resistant sapphire crystal, displaying the Omega Co-Axial Master Chronometer Calibre 8700. This swiss made watch is finished with a water resistancy of up-to 50metres, a functional and fashionable timepiece perfect for the modern lady.